I had a seat at the poker table with him. We played several hands. He won some of them and some of them I added to my stack. 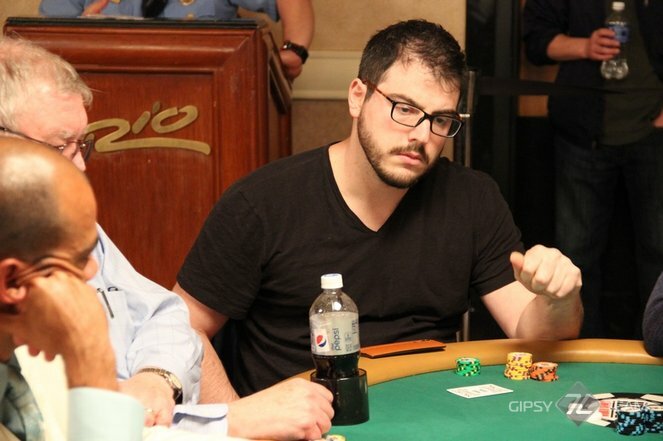 You play the Main Event? Sorry about that. But yet, playing the Main Event and make it to Day2 (and having a picture with Scott!) is already a big deal, GG ! Yeah, thank you! 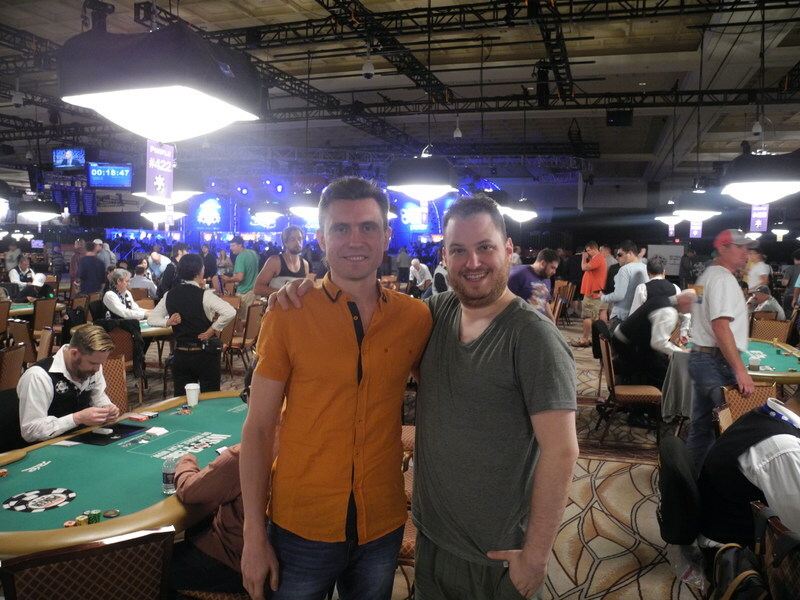 It was my dream to play the Main Event! Next step - is to make it to the final table! Good luck next year! I thought only Pokerstars did rollercoaster rivers! 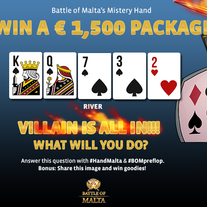 Battle of Malta's Mystery Hand - THE RIVER - Win a €1,500 package! It is nice seeing K on the flop, but it still remains very dangerous with 3 spades in it. 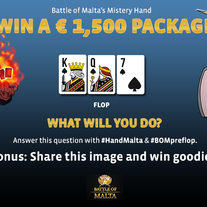 As we suggested villain called our preflop reraise and now he continues the pressure with his bet on the flop. 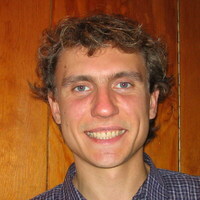 He is bluffing with the high probabality, but still he can have at least 1 spade in his hand. We still have very strong hand and we should take the bank now or make it very big to have our profit good if opponent calls. So, it is obvious we should reraise. And the size of reraise should be about 36.000. 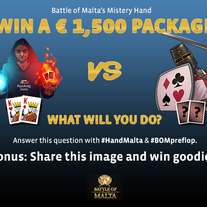 Battle of Malta's Mystery Hand - Win a €1,500 package! It is the situation close to bubble. It is important. We need to play aggressively with good hands and to fold large spectre of weaker hands. Also it is the time to press on short stacks. We have Pro player against us who does exactly what he needs to. We are not very interested to play flop, turn and river against him, especially as we do not know any information about playing against him on any streets. Except he bluffed recently. 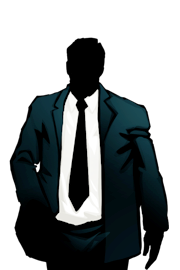 As a result, we suspect that he will play large spectre of hands just to steal blinds. But it is very risky to slowplay against him becasue our stacks are similar and he will continue pressing on us on other streets. So, we should take initiative in our hands and to play aggressively against him. I propose to raise from 15,000 to 20,000. It is ok if he folds. But it seemed that he will call. And it is good to make the bank big to win more chips from him. You've been a lot to play on this mission, so you have 24 more hours to get likes for this 1st step! The FLOP will be revealed tomorrow.